If you’re a parent in an active family, you know that it’s not unusual to deal with injuries to the kids. By now, you’ve probably also figured out that if you don’t know basic first-aid when it comes to sports injuries, you could be spending a lot of unnecessary time and money in the ER. Here are 3 common sports injuries and how to help your kids if and when they get them. From basketball to snowmobiling, your youth will more than likely experience the very common sports injury, the sprained ankle. If your kid has sprained their ankle, get them off their feet immediately in order to minimize swelling. Ice it, but don’t leave the ice on for more than 10-15 minutes at a time, as prolonged icing will damage tissue. After you ice it, wrap the ankle in a sports bandage. If you’re caught out without this tool, use a t-shirt until you can get the right bandage to use. Dealing with kids and injuries can be challenging because they won’t be used to sitting around doing nothing, but no matter how persistent your little player is, do not let them put weight on that ankle for at least 48 hours. Now that you’ve taken care of the preliminary treatment, you can schedule a doc-tor’s or trainer’s appointment to make sure nothing is torn. It can be pretty alarming to see your kid running at you with a face full of blood. Before you rush to the ER, though, check to see if it’s a nosebleed. Nosebleeds are common for kids involved in outside activities that could end up in crashes and collisions. Your child will probably be a little hysterical, so it’s important to remain calm and to calm down your child. Do not let your child lean back; have them sit upright. This is important to remember, because your intuition will tell you to lean them back to get the bleeding to stop, but it doesn’t work like that! Pinch the soft spot of the nose under the bridge for at least five minutes. If the bleeding persists, continue to apply pressure for 10 minutes. An ice pack can also help if it’s a real bleeder. Most nosebleeds will stop after 30 minutes of applied pressure and icing, so if it’s been longer than this and your kid is feeling dizzy, you will need to make that 911 call. Dehydration is a lot more serious than it sounds. 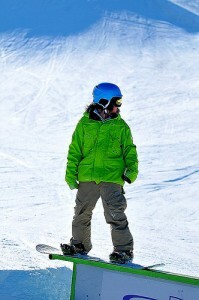 Youth playing sports or engaging in high-adrenaline activities such as biking or snowboarding will often neglect drinking wa-ter. Athletes will tell you the importance of drinking water to keep up strength and also to avoid landing yourself in the ER. As a parent of a daredevil kiddo, it’s your job to make sure he or she stays hydrated. Feed your child Gatorade or Pedialyte before events and DO NOT let them drink soda. If your child is complaining of muscle cramps, dizzi-ness, headaches or general muscle pain, these are all signs of dehydration. These symp-toms mean that your child has already lost 2 percent of their body weight in sweat. Get your kid out of the sun and get them pumped full of liquids. Once your kid has gotten to this point, it’s best not to let them back into the sun for the day and to monitor them the entire day. If, by the end of the day, the child doesn’t improve, seek medical attention. It’s so fun to watch your kids get active and energized by sports and outdoor activities, but it’s also important to keep your kids safe and healthy. Follow these basics rules for common sports-related injuries, and you could save yourself the stress of sitting in the ER all day. But, there are times when it’s crucial to seek medical attention, so just make sure to be educated and pay attention to your kid’s symptoms. Mike Nichols writes for gokart.org, a site that promotes safety during high-adrenaline activities. If your child loves to participate in power sports, find out more about keeping them safe. Is my child depressed? How to support a child with mental illness.